Rhee Gold’s vision is to bring the positive aspects of dance to the forefront with videos, articles, quotes, products and more. The Rhee Gold Company would like to offer a $99 gift certificate for the positivedance.com website to THREE DA readers. Winners can choose from an array of products like t-shirts, subscriptions to Dance Studio Life Magazine, handbooks, DVD’s and more. 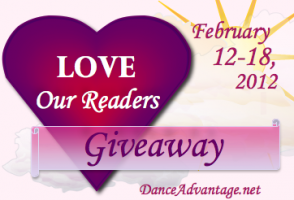 The Positive Dance giveaway is open to residents of the U.S. and Canada, ages 18 and up and closes at Midnight EST on Wednesday, February 22. Tell us about a mentor/teacher who has inspired you. Complete as many as you like. Come back and Tweet once every day of the Positive Dance giveaway. We know it’s been a week but can’t resist just one more surprise giveaway for tomorrow! I asked my daughter (she’s 11) since I am not the dancer in the family. She said her first dance teacher inspired her to want to continue to dance because she always shared her passion and love for dance with her. She is an amazing role model and even though we’ve since left that studio, I know she will never forget her! I’m not the dancer, but my daughter says her inspiration is her studio owner. Not only does she own the studio, but she teaches all the little one’s classes and has 4 kids of her own. She is compassionate and shows her love of dance and the girls everyday. As a parent I’m inspirited by the passion my daughter shows in dance. She has made the choice many times to chose dance over other activities that her teenage friends are involved in. My boss jackie Kriens has inspired me the most. She worked through her 30’s into her 40’s to achieve her Cecchetti Diploma status; a feat less than 300 living dancers have accomplished. I had a teacher in college that was amazing! She had traveled and performed around the world but that wasn’t enough. She has a passion that she needed to share with others in a different way. She had to be able to carry that on and give her students the opportunities to travel and perform. She is amazing and has accomplished so much in her life! Alonzo King was a huge inspiration for me as a young dancer. He taught me the value of pushing through self imposed limitations. He ranks up there with my top mentors! I’ve had some inspiring teachers, but it’s my students that really inspire me to dance. Their joy and excitement in class is what really keeps me going. I wouldn’t be a dance teacher if it wasn’t for them! If it weren’t for the dedication of our students and dance families, our studio wouldn’t be where it is today! Rhee Gold is a teacher who inspires me. I find his outlook on the dance studio industry and competition very similar to mine. Although we’ve never met I look to his facebook and youtube postings everyday for inspiration, and to remind me I don’t have to play “that game” in order to teach dance. I also greatly admire Darryl Retter. I have met him and he has taken the time to correspond with me, to offer advice and suggestions that I use to benefit my students, my studio and myself. I have two wonderful teacher/ mentors. 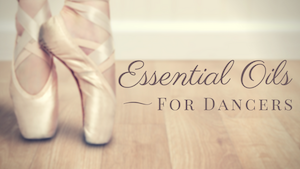 I didn’t start ballet until I was an adult, and at the time I wanted to start not many schools or teachers would take adult beginners. The first wonderful teacher became a good friend as well and taught me with great patience. After moving, I had a long gap without any dance and the next wonderful teacher was just as encouraging and even let me take classes with much younger students (when adult classes were not available). I have much gratitude for both of them! My modern dance teacher when I was a young adult her name was Jerry Bywaters Cochran. She knew how to inspire us to do our best and to teach us the real meaning of dance that every movement had a reason and purpose. my ballet teacher growing up has always been a huge inspiration to me, and allowed me to be where i am today. Creative dance teachers who share their ideas are so inspiring to me! My 2nd grade teacher understood how much I loved reading, and took me to a special reading convention with my mom, and just really encouraged me. She was awesome. My mentor was my ballet teacher who later hired me to teach for him. He trusted me to become a great teacher even before I trusted myself. He instilled enough confidence in me that I was able to disagree with him and stand up for myself. Now that he has died, he continues to live on through me each time I stand up for what I believe in in the world of dance. Well, I just started dancing as an adult but I love that my teacher works us hard and takes the time to teach us even though we’re adults. Love this post! I was lucky enough to grow up in my mother’s studio surrounded by many great women who helped raise me to be the person (and dancer) I am today. My teacher, Sarah Mason provided me with a new appreciation for dance (tap dance specifically) when I transferred to her studio in high school. Stressing the importance of our Tap Genealogy, always making us work our hardest and being interested in our lives off the dance floor, Sarah has been an amazing teacher and mentor. If it weren’t for her, I wouldn’t have taken class with so many AMAZING tappers and I wouldn’t have applied for an internship at the 1st Annual Jersey Tap Fest. Love you Miss Sarah! I had a teacher in college that really inspired me to be better not only as a dancer, but because I wanted to teach, I wanted to learn as much as I possibly could from her. She pushed me and truly changed me as a dancer. One of my teachers growing up had such a love for dance and for her classes, and it really showed. I’ve tried to emulate her passion in my dance classes, and she has inspired me as I’ve become a teacher and remembered the way I felt in her classes. My mentor is definitely the first teacher who took notice of my ability to teach. She gave me a chance that completely changed my life and to that I am eternally grateful! One of my teachers in college was a huge inspiration to me. She has the best technique of anyone I’ve ever met (watching her balance is a revelation), and was one of the first teachers I’d had to combined an understanding of anatomy with her dancing. She helped me find better ways to work with my body, and never once believed that I couldn’t dance even though I have some physical disadvantages. I have taken inspiration from eveyone I have danced with through my life. My childhood teacher was the first to see my potential as a dancer and encouraged me to persue dance in college. It was the best choice I could have ever made. I had the oppurtunity to dance and learn from some of the most amazing women who gave me support through a difficult time. I can’t pick just one person…. because everyone I have met has been an inspiration to me in some way or another. After being a teacher now for 11 years, I am still meeting new people who inspire me to work harder and be a better person, teacher, and dancer! I have been lucky to have quite a few excellent teachers that have inspired me! One would be my dance teacher that I had for many years of my life. She also hired me to teach at her studio! She believed in me so much and pushed me to be the dancer I am today. When a performing arts high school came into our area she pushed me to audition! Thanks to her I got in and it was the best thing I could have ever done!! Although I no longer work for her, her inspiration is what helps me be the teacher I am today! My current dance teacher is such an inspiration to me. She started her studio her senior year of college. She just graduated from Ohio University in June of 2011 with a Bachelor of Fine Arts and she now teaches classes 6 days a week. She’s the studio owner and teaches almost all the classes. On top of that, she took over the East Central Ohio Dance Theatre this year and the annual Nutcracker production had the biggest turn out yet! In September of 2011, she gave me the honor of being one of her two assistants even though she’d only known me for 2 months. She believes in me and that I could go as far as I want even though I started formal training at 14 (in September). She gives everyone a chance no matter what and she’s always there for you, dance wise or as a friend. My daughter has a whole studio of wonderful, supportive and inspired teachers. They are always encouraging, yet firm when necessary. My daughter enjoys being inspired and challenged to perform her best. I have always been inspired by the people who encourage me, when I see the talent they have. My dance and baton twirling teacher helped me discover the joy that is dance and baton twirling. My love of children was passed down from my grandma. It was an acting teacher who inspired me in all performing areas by saying “you are huger than you allow yourself to be”. By making explicit what I already knew–that I hold my own self back–continues to remind me to push myself.